Free Beauty to Glow Tanning Towelettes at 12pm EST! Be one of the first 500 people to fill out this form at 12pm EST today to score free Dr. Dennis Gross Skincare Beauty to Glow tanning towelettes! 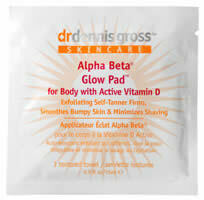 Dr. Dennis Gross Skincare Beauty to Glow. These face and body tanning towelettes are packed with exfoliating glycolic and lactic acids to deliver a smooth, even bronze. I'm definitely going for the freebie. Thanks for sharing the opportunity with us.